Discover properties of gases and learn about the anatomy of an egg by observing eggs cooked and cooled in different ways. Place all three eggs in a pot and cover them with water. Heat with the lid on until the water boils, and then turn the heat to low. Let the eggs cook for 12 minutes, then take them off the stove. As the eggs are cooking, fill one container with ice and water to create an ice-water bath, and fill a second container with room-temperature water. When fully cooked, place one egg in the ice-water bath, a second egg in the room-temperature water, and leave the last egg in the pot of hot water (off the stove). Let all three eggs sit for 20 to 30 minutes. When they’re cool enough to handle, peel each one, taking careful notice of how they smell and how easy they are to peel. Cut each egg in half. Is there a difference in how they look and smell based on how they were cooled? Cooking is all about chemistry, and the familiar experience of boiling an egg can offer great illustrations of some of the properties of gases. 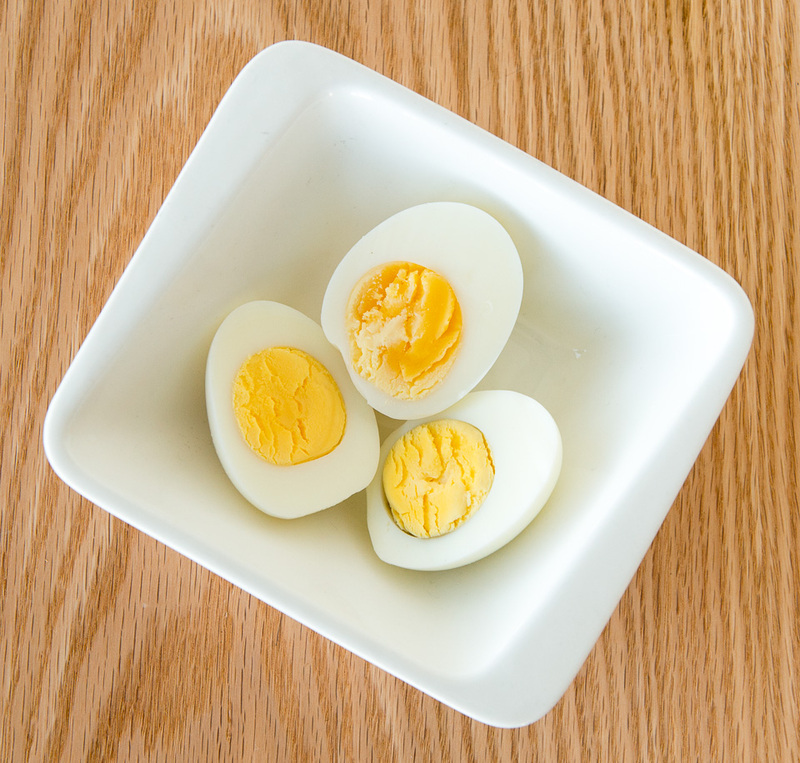 In this Snack, you may have noticed that the ice-cooled egg was the easiest to peel, followed by the room-temperature egg. That’s because of the egg’s internal structure. Just inside the eggshell are two membranes that cause the egg to stick to its shell when dried out. In between these membranes is a little sac of air called an air cell. When this air cell is heated, the gas inside expands according to Charles’s Law, which states that the volume of a fixed amount of gas increases as its temperature increases. When the egg is rapidly cooled, the volume of the air cell decreases quickly, pulling the membrane away from the shell and making it easier to peel. The opposite happens inside the egg that stays in the hot water, which cools gradually over a long period of time. When cooled slowly, the membrane stays attached to the egg, making the shell difficult to peel, even after it cools down. The size of the air cell increases as an egg ages, so this effect is most dramatic with older eggs. Fresher eggs have smaller air cells, so may be difficult to peel no matter how they’ve been cooked or cooled. Once you peel and halve the eggs, you may notice that the slow-cooled egg has a greenish ring between the yolk and the white. The gray-green compound is iron sulfide, and that’s what’s responsible for the “eggy” odor of some hard-boiled eggs. Iron sulfide forms when hydrogen sulfide gas in the egg white reacts with iron compounds in the egg yolk. The solubility of a gas tends to decrease as temperature increases (think of a flat, warm soda versus a fizzy, cold soda that can keep more carbon dioxide in solution). Quickly cooling the egg keeps more of the hydrogen sulfide in the egg white: the gas doesn’t diffuse into the center, so it doesn’t react with the yolk. In the slow-cooled egg, which is warm throughout, the hydrogen sulfide is not as soluble in the white. It migrates to the yolk, where it reacts with iron, giving the egg yolks a green rim. The room-temperature egg should be somewhere in between. 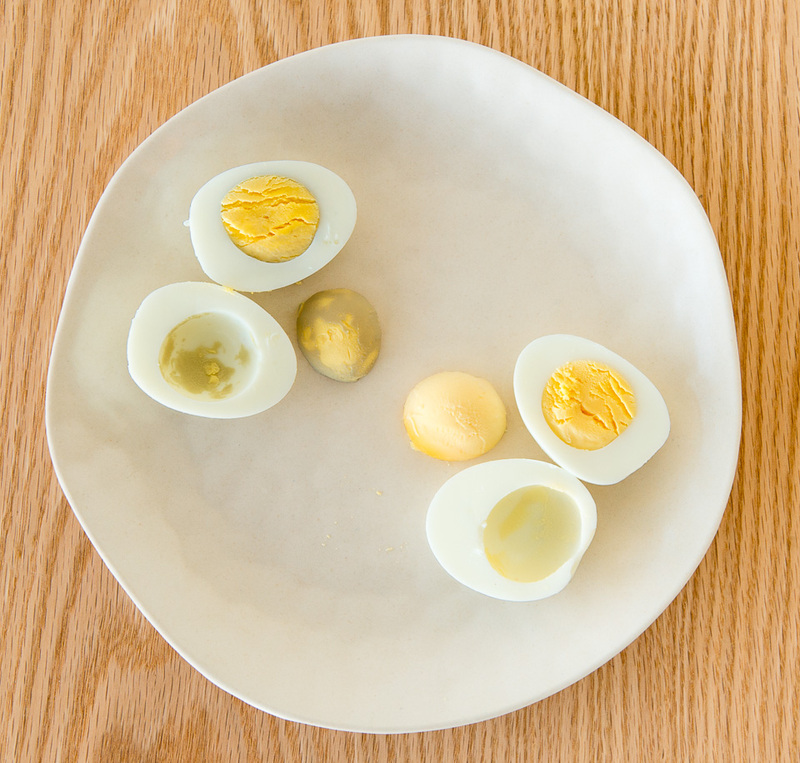 The verdict: For easy-to-peel eggs with bright yellow yolks, use older eggs and try quickly cooling them in an ice-water bath after boiling. Does your family have a favorite technique for boiling eggs? Tips and tricks for the best hard-cooked eggs include poking a hole in the egg before boiling, adding salt or baking soda to the water, and steaming instead of boiling. Try these out and see if you can determine if they improve the final result and if there’s a scientific explanation for why. Discover the relationship between temperature and volume of a given amount of gas. 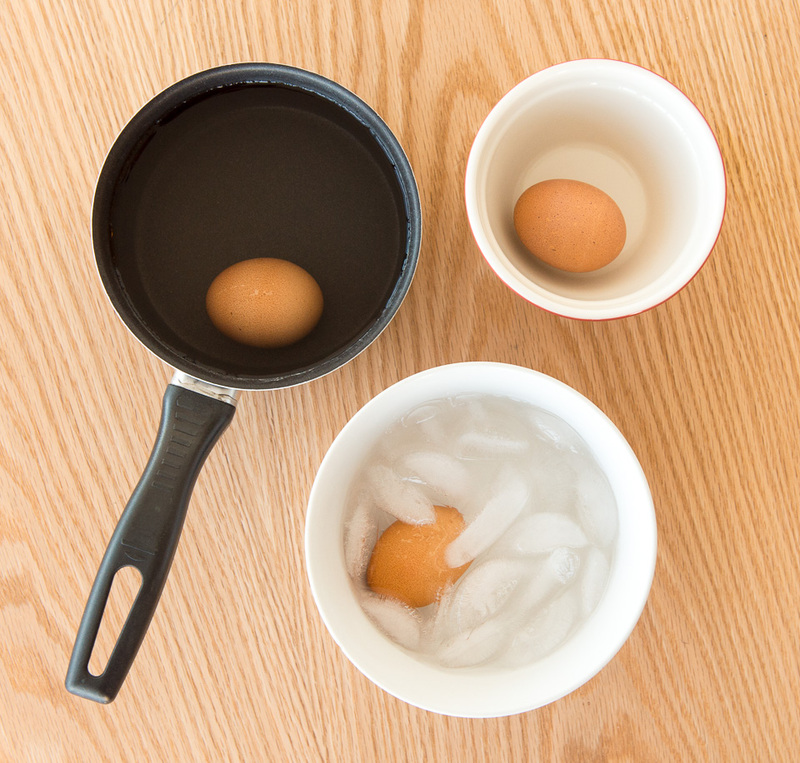 Watch de-shelled eggs swell and shrink in different fluids. A fun way to visualize gas molecules in constant motion.